A mother needs to rest her body as much as possible after any delivery, but recovery from a C-section can take longer. Don’t worry: Your body will heal, but you must remember that C-sections are a major surgery. 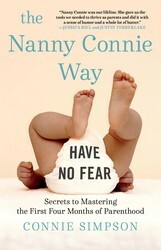 Connie Simpson, author of THE NANNY CONNIE WAY, shares the rules for care. C-sections used to be the last, emergency-only resort for childbirth, but that has shifted in the last twenty years. For some women, especially those who are having multiples or are older, a C-section might be recommended to make the birth shorter and safer. For other moms, it’s a deliberate choice. It can be scheduled on a day convenient for them and their surgeons, and babies plucked out via C-section certainly have less birth trauma than those born the old-fashioned way. I’ve also seen many moms have unexpected C-sections, and they are unaware that this is major surgery. They are not clear on the recovery, the care, the scar that will never go away, or the immediate pain. Don’t lift anything weighing more than five pounds for the first two weeks. If your baby weighs more than that, you have to be very cautious if you do not have assistance. Don’t try to finish the laundry or pick up your two-year-old in the saddle position. There is a reason doctors give you a lifting restriction of five pounds. Trust me, it will be hell to pay in the end. Don’t consume spicy foods, sparkling water, or fizzy carbonated drinks, which cause gas and can be painful. Try to limit intense laughter, which can cause great pain. I remember being with John Krasinski and Emily Blunt right after the birth of their first baby. As a big Bernie Mac fan, John suggested we watch some of his standup. We didn’t make it past the first two jokes because the laughter made Emily’s pain so excruciating. Don’t ignore the scar. Keep the area dry. This means no showers or baths until your doctor gives you the go-ahead. If there is any redness, unusual tenderness, swelling, or if you have a fever, call your doctor right away. You might have an infection that should be treated immediately. There are many over-the-counter creams to help scars heal, so ask your doctor for advice. Applying vitamin E oil or any neutral oil and massaging the scar will help the healing process once your stitches are out. Don’t strain when you have to go to the bathroom. See if a stool softener will help. Don’t run up and down the stairs. I can’t begin to tell you the number of mothers who ignored this instruction, came home, ran up and down the stairs, and learned their lesson through the power of Mother Nature! New moms – check this out! Nanny Connie shares breast-feeding dos and don’ts. Excerpted from The Nanny Connie Way by Connie Simpson. Copyright © 2018 by Connie Simpson. Used by permission of the publisher. All rights reserved.